Sahar Zukerman was born in 1985 in England and grew up in Tel Aviv. In 2009, he moved to Berlin and began to study at the Universität der Künste, where he made his Meisterschüler degree in the class of Leiko Ikemura in 2013. 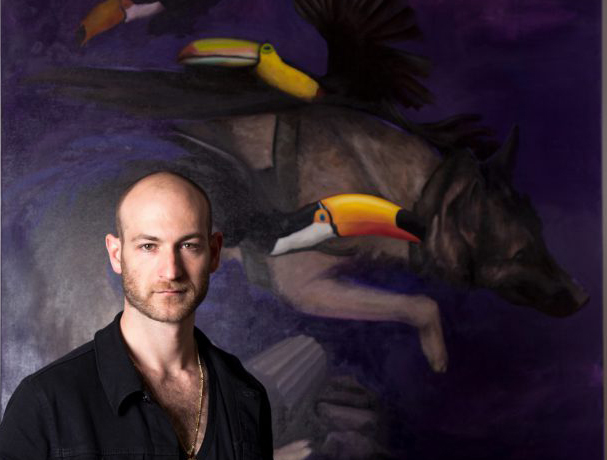 He works mostly in painting, but is also dealing with the field of digital modes of display. For his first solo show at Galerie Crone, he invented a large scale tableau in which he connects the technique of classical painting with forms of digital visualizations by using an elaborate lenticular printing method. Caused by a certain arrangement of prisms, the motif is changing and moving, depending on the viewer’s standing point. In most of his works Sahar Zukerman alludes to the thematic basis of his mysterious and enchanted paintings. The dystopia, the pattern of local and global structures, consisting of conspiracy theories, threat scenarios and irrationality, is displayed in various and complex ways. The works show elements of mythology and collective memory as well as cartoon figures and theaters of war. Due to the origin of the artist, the paintings are very much related to Jewish culture but are also comprehensive in a global context: history, religion and mysticism are used to establish irrational structures of power.